Gary Wilmot says he wishes he had the concession for the Kleenex stall in the foyer at Chichester Festival Theatre. 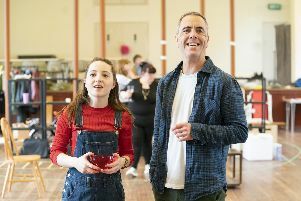 You can expect plenty of emotion in Flowers For Mrs Harris – a new musical based on the novel by Paul Gallico – in which he is currently starring. ‘I wasn’t involved in the original production in Sheffield, but I heard great reports about it, and then they asked if I would like to audition for it, and really at this stage in my career, I just want to be involved in good-quality work… and this is right up there! ‘The quality of the performances in the show are better than anything I have ever seen, and Clare Burt as Mrs Harris is just an extraordinary performance in every way. She has got a huge, huge job, but she is also just the most delightful person… and an amazing performer. ‘I heard (director) Daniel (Evans) talking about her as being a woman who thinks she is ordinary, but she absolutely isn’t. She is extraordinary in ways she just doesn’t know. It’s the way she cares for people and is so kindly. It is set in a period that has gone, the way people used to look after everybody. But it is the effect she has on people. She does not set out to change them, but she does. It is a wonderful role. I have enjoyed the film many times before, but the film had a slightly-different approach. Gary is joined in the cast by Laura Pitt-Pulford playing two characters who almost complete their own circle. ‘In the first half I play a girl called Pamela who is a wannabe actress,’ Laura says. 'She is based in London and she is one of the clients that Mrs Harris cleans for, and she is very needy towards Mrs Harris. She is quite eccentric. She just wants to be loved and adored, and she needs Mrs Harris to make her feel that she has worth – and Mrs Harris does this unknowingly for her. ‘She is not maybe the nicest of the characters, but she has heart. It is just that it is hidden within her own insecurities. She reminds me a bit of a version of my teenage self, a much more heightened teenage version, that stroppy thing of going from one emotion to another! Laura was in director Daniel’s production in Sheffield a couple of years ago: ‘It was a full production, but since then there have been some changes made. There was a workshop on it last year, and they changed a few things, not so much anything that an audience would necessarily notice, but some of the characters are slightly changed so that they have become even more three-dimensional than they already were. Flowers For Mrs Harris is on now until September 29 at Chichester Festival Theatre. Go to cft.org.uk.